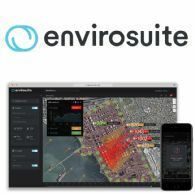 EnviroSuite Limited (ASX:EVS) (FRA:57P) is an environmental management technology company that has developed a leading Software-as-Service platform which translates data into action in real-time. 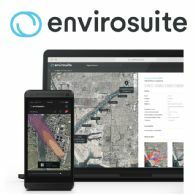 Using proprietary algorithms built on more than 30 years of environmental consulting experience, Envirosuite's platform provides a range of environmental monitoring, management and investigative capabilities. 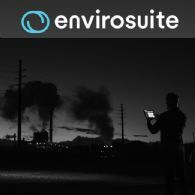 Envirosuite's platform is used worldwide by a range of clients in the mining, oil refining, transportation and water management industries and by governments looking to regulate industry in accordance with community well-being. 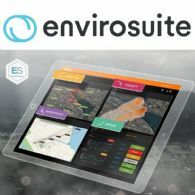 Environmental management technology company Envirosuite Limited (ASX:EVS) is pleased to announce that further to the win with Sopraval announced 2 July 2018, it has obtained agreement for another new platform subscription in Chile, and that this represents the largest ever SaaS subscription in the Company&apos;s history. Environmental management technology company Envirosuite Limited (ASX:EVS) is pleased to announce that it has sold a new platform subscription to agriculture company Sopraval S.A..
EnviroSuite Limited (ASX:EVS) (FRA:57P) is pleased to advise that it has secured a major contract in the Middle East with a large state owned public works authority for a city-wide odour monitoring and management system. 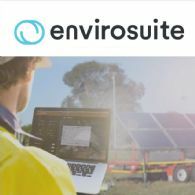 Envirosuite Limited (ASX:EVS)(FRA:57P) is pleased to provide an update on its progress with the UK-based water utilities group Thames Water, the UK&apos;s largest water and wastewater services company. Thames Water has now committed to an Envirosuite subscription at a fourth site. EnviroSuite Limited (ASX:EVS) Quarterly Sales Update Reflecting a growing pipeline and sales team. 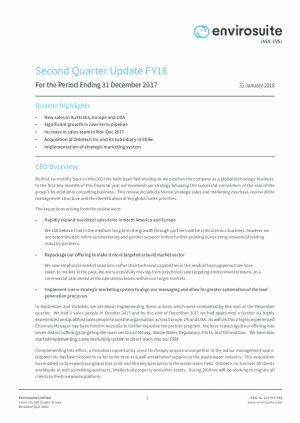 Your directors are pleased to present their report on the consolidated entity consisting of Envirosuite Limited (ASX:EVS) and the entities it controlled at the end of, and during, the half year ended 31 December 2017. 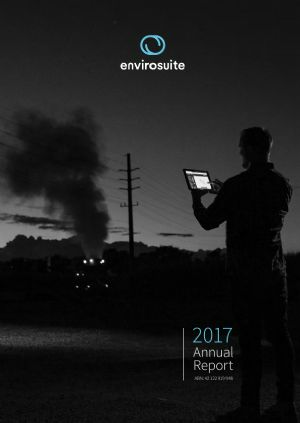 EnviroSuite Limited (ASX:EVS) provides the Company&apos;s second quarter update FY18 for the period ending 31 December, 2017. 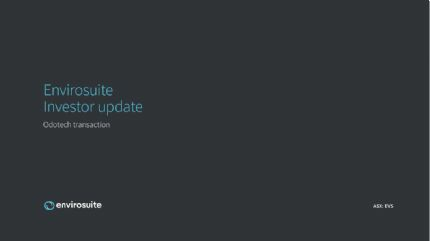 Further to recent announcements regarding the Odotech transaction, Envirosuite Limited (ASX:EVS) is pleased to provide the attached presentation setting out the key transaction details as well as the rationale and integration strategy. Envirosuite Limited (ASX:EVS) is pleased to advise that, further to the ASX announcement released 8 December 2017, the Superior Court of Canada has now approved the transaction for the Company to acquire the assets of Odotech Inc from the Trustee in accordance with the asset purchase agreement.